A joint trip to Jerusalem’s Holocaust Memorial provides Palestinians and Israelis with lessons in tragedy, pain and mutual respect. “Please excuse my broken Arabic,” our guide, Yehuda Yarin, told the mixed group of Palestinians and Israelis who had come to Jerusalem’s Holocaust Memorial, Yad Vashem, to learn more about the Holocaust as part of a three-day, self-financed joint trip (Tiyul-Rihla) which had taken them to Acre, Haifa and Jerusalem. When the new Yad Vashem – the largest Holocaust museum in the world and Israel’s second most popular tourist site – was opened in 2005, the odd Arabic-speaking group would come to visit, and Yarin, who had begun working as a guide there, was asked to show them around. Since then, Yarin has guided Palestinians, both from the West Bank and Israel, as well as the occasional visitors from further afield, such as Egypt. “Some of them know nothing. Some of them never heard about the Holocaust. Some of them know the history. It depends,” he notes. Although Yarin is at pains to emphasise that he doesn’t know what his Arab visitors “think in their hearts”, he is generally impressed by the level of interest they exhibit and their inquisitiveness. “I’m glad when they ask questions,” he confesses. With the help of Arabic-speaking Israelis and Hebrew-speaking Palestinians in the group, Yarin attempted to convey the magnitude and mindlessness of the one-sided slaughter to his audience. He said that the Holocaust was unique among modern mass killings because it was completely ideological and was not an extreme manifestation of a political conflict – over territory or competing nationalisms – as other attempted exterminations were. “The Jews were not the enemies of the German people and they represented no threat to Hitler,” he explained. Although in terms of Jewish history the Holocaust is unique, sadly, the annals of 20th century butchery are filled with genocides, classicides and other mass murders of defenceless groups. Inside the sombre and sober pyramid-shaped, zigzagging galleries of the museum, the Tiyul-Rihla group of seven Israelis and six Palestinians, who had come on this three-day excursion which was organised by volunteers and largely paid for by the participants, wandered through Nazism’s hall of shame, starting with the rise of Hitler, through the Warsaw ghetto, to the horrors of the “Final Solution” and its death camps. Familiar with this horrendous chapter in history, the Israelis followed the commentary and exhibits mostly in rapt silence. For the young Palestinians who were being exposed to the full extent of Nazi atrocities for the first time, their attempts to grasp the enormity led them to ply our guide with a constant stream of questions. The personal stories showcased in the museum gave the whole experience a human face which the Palestinians visibly appreciated, while the section dedicated to the “Righteous among the Nations”, which chronicles non-Jews who protected Jews – including Muslims in Bosnia, Albania, Tunisia, Morocco, Algeria and other countries – elicited the interest of both sides. The Arabic being spoken by members of the group drew curious glances from Israeli visitors to the museum, who seemed to be trying to figure out what we were about. The passers-by included groups of young IDF recruits, apparently on motivational tours, who caused unarticulated yet visible stirrings of discomfort among the young Palestinian, whose only exposure to Israeli soldiers, though they are of a similar age, is as agents of the occupation. 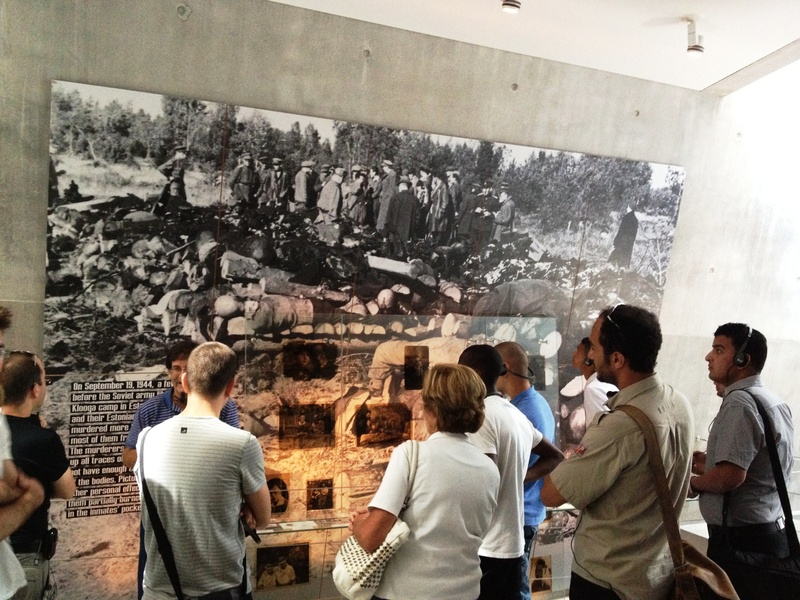 Although some in the group had been to Yad Vashem before, experiencing it with this unusual group was an eye-opener. “It’s important to see something you think you know well through someone else’s eyes,” believes Dara Frank (22), an American-Israeli student who is currently working on a master’s in international relations at the Hebrew University, because it makes you “start questioning what you think you already know”. “When it comes to the Holocaust, we only learn the basics about it at school, that Hitler slaughtered the Jews, so this trip has helped us acquire a lot of extra knowledge,” reflected Mohammed Mahareeq (23), who is originally from Hebron but works at a hotel in Ramallah and volunteers with the Palestinian Red Crescent. The idea that Palestinians study the Holocaust at school, visit Yad Vashem and display genuine interest in the tragedy that befell the Jews of Europe is likely to come as something of a surprise to many Israelis who see regular reports in the media of Arab and Muslim Holocaust denial. One recent example was Hamas’s angry response following the visit to Auschwitz by Ziad al-Bandak, a senior aide to Palestinian President Mahmoud Abbas. Describing the Holocaust as an “alleged tragedy”, a Hamas spokesman said the visit was “unjustified and unhelpful”. While Hamas’s outburst, as well as the relative availability of literature questioning the Holocaust in some Arab countries, prove that there are certainly Arabs who insultingly deny that this horrendous crime took place. But fixating on Holocaust deniers, as many segments of the Israeli media tend to do, distorts the reality and downplays the importance of the work of the likes of al-Bandak, who visited Auschwitz and expressed sympathy for the historic plight of his people’s enemy, and he did so during a period of heightened animosity and distrust between the two sides. And he is not a lone wolf. Many Palestinians are aware of the historic tragedy that befell their Jewish neighbours, but are often muted in expressing their sympathy due to the bitterness of the conflict or out of a conviction that it will be used as a political weapon against them. “Many Palestinians feel that sympathising too much with Israelis could lead to justification for the occupation,” Sami Adwan, a professor of education at Bethlehem University, was once quoted by the BBC as saying. But there are those who point out that mutual sympathy is essential to building trust and understanding between Israelis and Palestinians. Determined to act on this conviction, one eccentric Palestinian-Israeli opened up his own tiny Arab Holocaust museum in Nazareth some years ago and tours the West Bank raising awareness about this dark chapter. “When Palestinians learn about the Holocaust, they will understand the Jewish people better and can begin to develop a shared history,” Khaled Mahameed, the founder of the tiny museum he established with his own money, was quoted as saying. And building understanding and compassion is exactly what the joint Tiyul/Rihla that brought these Palestinians and Israelis to Yad Vashem is about. “The idea behind the initiative is to expose each side to the other side’s narrative, and to have a very deep conversation about it,” explains Israeli journalist and activist Nir Boms, one of the originators of the idea. “Personally, I think this trip is very interesting because it’s breaking down the walls between us: Israelis and Palestinians,” said Ibrahim Yassin, an activist and professional cook from East Jerusalem whose night job, as attested to by his hip hop look, is as a DJ. There have been three join trips to date (two to Israel, one to the West Bank), and the participants brainstormed ideas for a fourth, to Palestine. The Palestinians wished to introduce the Israelis to al-Nakba (the Arabic for “The Catastrophe”), which is the term Palestinians use to describe perhaps the most defining trauma in their national experience: the exodus of up to three-quarters of Palestine’s Arab population, most of whom were not allowed to return following Israel’s declaration of independence in 1948. 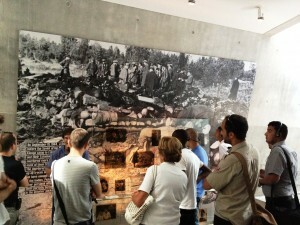 However, they lamented the absence of a museum chronicling this painful chapter of Palestinian history. Some Palestinians suggested that the Israelis should join them on a trip to a refugee camp to enable them to gain a deeper insight into what contemporary life is like for many Palestinians. This article first appeared in Haaretz on 19 September 2012.